Philippine President Rodrigo Duterte has confessed that he personally killed suspected criminals when he was mayor of a southern city to set an example for police. He made the comment in a speech late on Monday night to businessmen as he discussed his campaign to eradicate illegal drugs, which has seen police and unknown assailants kill thousands of people since he became president on June 30. “In Davao I used to do it personally. Just to show to the guys (police) that if I can do it why can’t you,” Duterte said in his speech at the presidential palace. Duterte, 71, also responded to criticism from human rights groups and US President Barack Obama about his anti-crime tactics, vowing he would not be intimidated by their criticism into stopping. “Sorry, I am not about to do that,” he said. 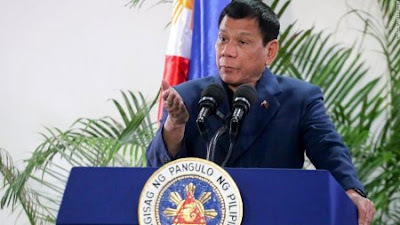 In a speech to expatriate Filipinos during a state visit to Cambodia on Tuesday, Duterte joked that as mayor of Davao he would go on missions with police and shoot blindly at criminal suspects. “I (would) sometimes go along with them. If you say I shot someone, maybe I did. I was closing my eyes because I am scared of firing a gun,” said Duterte, a lawyer and former state prosecutor.